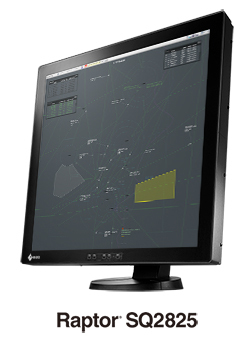 Hakusan, Japan, September 1, 2016 – EIZO today announced the new Raptor SQ2825, a 28.1-inch primary control monitor with 2048 x 2048 native resolution for air traffic control (ATC) centers. EIZO has been an industry leader in the innovation and development of 2K primary control LCD monitors for over 10 years. Backed by more than 45 years of expertise in visual display solutions, the Raptor SQ2825 is a 5th generation 2K x 2K monitor that adds further value with new technology and improved operational reliability. The monitor features a new, sleek cabinet design with unobtrusive bezels that are 40% slimmer than the previous model, measuring just 36.1 mm so air traffic control officers (ATCO) can focus more on the screen. The monitor’s depth has also been reduced, bringing the weight distribution closer to the center of mass, resulting in less stress on mounting fixtures over time. Weighing just 14.6 kg, it is also 50% lighter and more compact than its predecessor. The Raptor SQ2825’s newly designed rear housing can be easily configured to any mounting requirements without needing to remove any part of the housing. A chassis adapter or stand can be attached quickly, ensuring the flexibility to efficiently meet the requirements of any new installation or hardware refresh. The monitor is equipped with a unique direct LED backlight system which features superior brightness uniformity for smoother images compared to edge-type backlight solutions. It also has 16% more LED cells than the previous model for increased efficiency. The backlight system is newly designed and is divided into four interchangeable quadrants, each of which performs consistently over a lifetime of 100,000 hours. Each quadrant is controlled by redundant sub-unit driver boards that protect the on-screen information from being visually impacted in the unlikely event that an LED stops performing. The Raptor SQ2825’s backlight system also allows it to achieve a wide brightness range of 2 to 500 cd/m2 to suit the workstation environment as well as the needs of the ATCO. Consistent with each of EIZO’s 2K x 2K primary control monitors, the Raptor SQ2825 emphasizes durability and reliability over all else when it comes to long term use. It is developed specifically to meet the stringent requirements of mission-critical ATC with 24/7 operation. The monitor uses full sheet steel industrial-grade housing for durability in demanding environments. It is also designed to maintain low heat output, a leading cause of component failure, without a fan for reliability as well as noiseless operation. Protection glass is available as an option with two variations – standard and fully flat. Standard glass covers the visible part of the LCD panel and extends to the inside of the bezel. Fully flat glass reaches to the edge of the monitor for a smooth, streamlined look. The monitor’s housing is also built with edge protection for fully flat glass so it is not exposed and vulnerable to damage. EIZO offers extensive customization of its 2K x 2K primary control monitors so system integrators and ANSPs can build the monitor that best suits their needs. Customization includes, but is not limited to, mounting configuration, video signal interfaces, cabinet color, protection glass, and warranty upgrades. EIZO will be showing the Raptor SQ2825 for the first time at ATC Global 2016 in Beijing, China from September 12 – 14. Visit Booth B4-a to see the product. The Raptor SQ2825 is now available. Please contact atc@eizo.com for details. All product names are trademarks or registered trademarks of their respective companies. EIZO and Raptor are registered trademarks of EIZO Corporation.